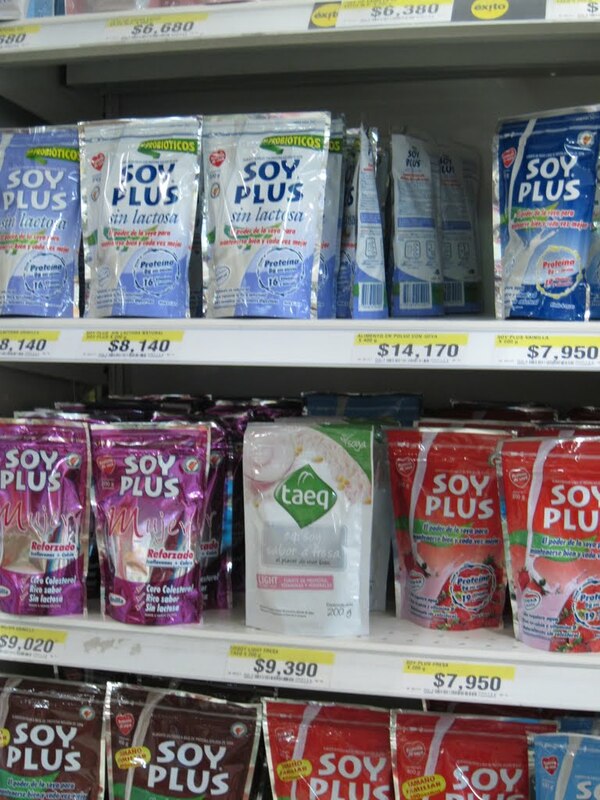 Being vegetarian in Bogota is pretty straightforward, as Happycow has 36 listings for Bogota. However, as a vegan, I had a few accidents where I ended up with a bit of cream or cheese on my plate as I didnt make myself very clear in Spanish or forgot something from the list of things I cannot eat. 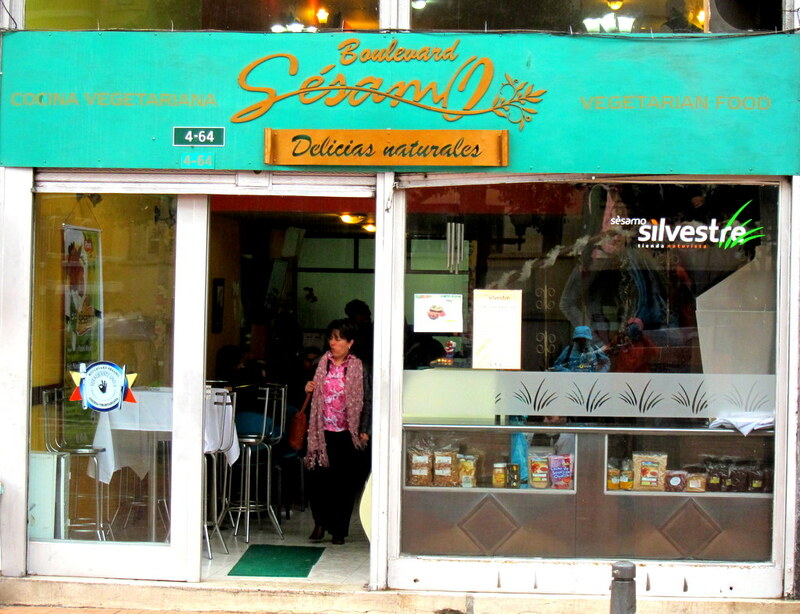 But on the whole, since we didnt stay very long in Bogota, we got to check out only two restaurants there, both of which very good. They are only open for lunch and have plenty of set lunch options. I tried the vegano burger and Swami tried the set lunch plate with rice and veggies and proteins and it comes with a free salad bar and a cup of juice with water. I think you can only use the salad bar once (not unlimited, but maybe I understood it wrong). 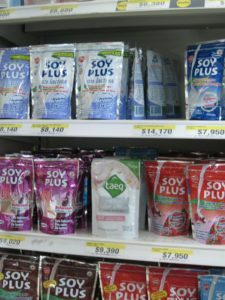 They have a little store where they sell essentials like seitan, veggie burgers, soy milk etc. El Loto Azul is an establishment run by Hare Krishna devotees, so eggs are out of the menu. Be a little careful about the milk though, as its ever present as in most Indian dishes. But the service is really friendly and the food is excellent. They also have a tiny store selling veggie essentials. 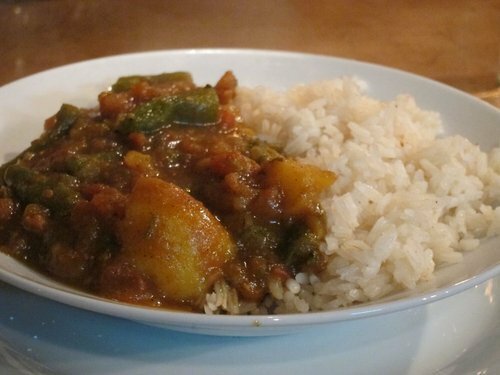 Sol De India is a lovely vegetarian restaurant run by Hare Krishna followers in the heart of the city. They are centrally located in the San Diego district (in fact, two blocks from another vegetarian restaurant). They have a set lunch and an a la carte dinner which includes items such as masala dosa (!!!). I didnt get to try the dosa, sadly. The set lunch can cost 8000 COL or 10000 COL depending on the number of dishes you can eat. They have a very cool A/C room and a lovely courtyard. The food was simple and very tasty. Our set lunch consisted of a juice (jugo naturales en agua), a soup made with maize flour, a plate with 4 dishes – rice, a salad, a lentil dish and a vegetable dish. For 8K, it was a great and filling deal. Find them here on Happycow. Hostels are a great place to discover good restaurants. Sometimes we stumble into cool vegetarian/vegan recommendations. We found a humble flyer for Hari Om vegetarian restaurant tucked away on a busy notice board filled with hordes of other pamphlets. It was a good fifteen minute walk, but totally worth it. It is run by Hare Krishna followers with a bit of an ital vibe thrown in and is open until 9 PM in the night. Not open on Sundays I think. Hari Om is on a busy street, a bit hard to find (the street numbers dont make any sense). But please do persist, ask around and find it. It would be great for them to have more customers and the food was delicious and people who run it are really friendly. The atmosphere is colorful, cosy and cheery. A huge plate filled with a salad, brown rice, a TVP entree, and a fruit based dessert (banana with cinnamon sauce). 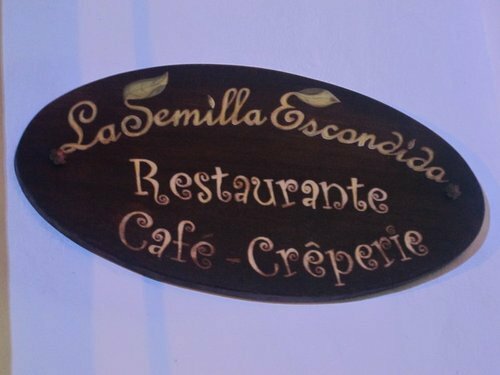 If you’re staying near or visiting La Setenta (Carrera 70), its close by from there. Here is the closest location I could find on google maps. Walk a block +/- to find it. Cali, Colombia is a huge city. Way bigger than we anticipated. Therefore, our time there was extremely limited. 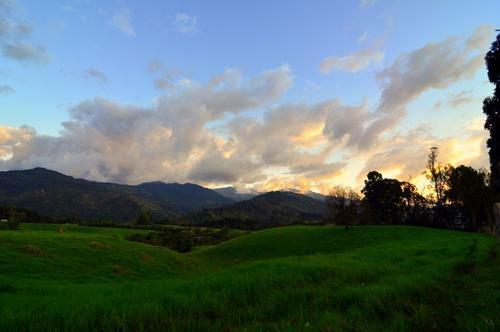 We were eager to move on to the next small town on our journey – Popayan. Before we left Cali, we visited a lovely Hare Krishna restaurant called Salud Vibrante. 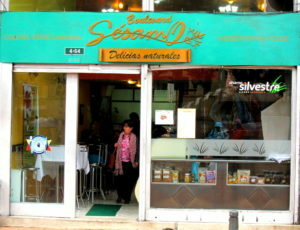 Salud Vibrante is located at Av. 6N No. 13N-17, about a 25 minute walk from the hotel Inter Continental. Its a small, unassuming place. So it may be easy to miss. Its across the street from a massive blue building (see pic below). The lunch was awesome! There is also a small counter selling something that looked suspiciously close to potato bondas! Unfortunately, I was too stuffed to try. 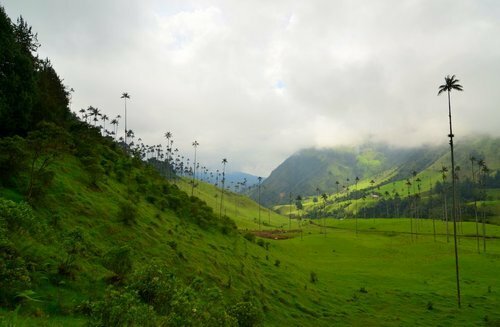 Popayan is a beautiful white-hued town in Southern Colombia. Its a charming colonial city with its white facade – all white colored buildings – in the old town area. 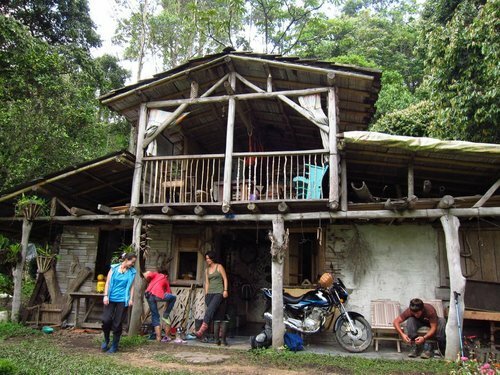 I highly recommend a visit to this place if you are travelling in Colombia. Soon after arriving at our hostel, I also discovered that Popayan is appointed as a UNESCO city of gastronomy. 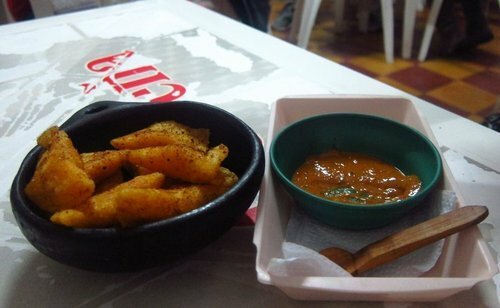 While Colombia is incredibly charming in many ways, I wasnt wowed by the food there – a decided lack of spice and vegetarian options led to rather bland experience during meal times, but that was not the case at Popayan. We stayed at the Park life hostel, where the owner turned out to be a fount of information about local food. 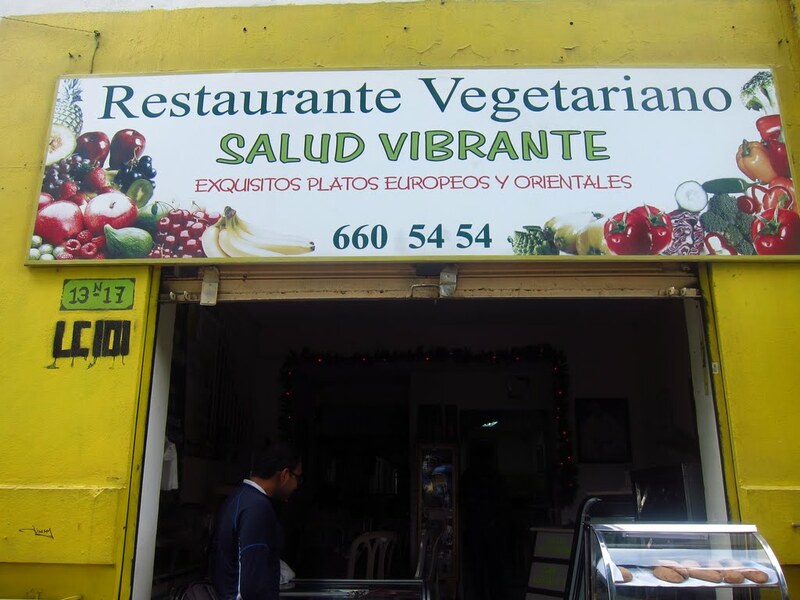 Not only that, the owner’s girlfriend is vegetarian, so he knew all the vegetarian hotspots. 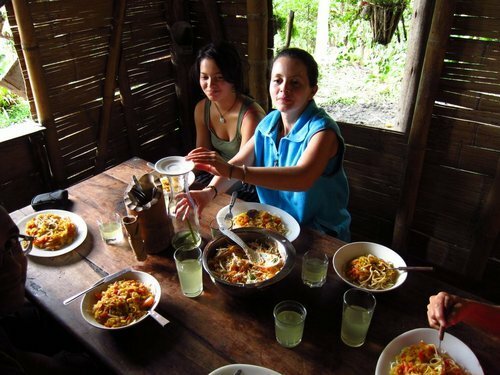 The hostel is charming with a tidy kitchen, so do try staying here – you can always cook something delicious if you dont feel like eating out. At the hostel, you’ll find information on the notice board on what to eat! 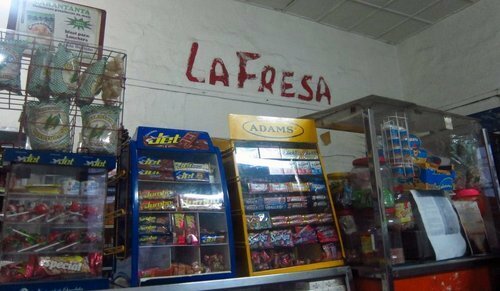 There is a tiny corner shop called “La Fresa”. Ask around and people will point you to it. As you get closer, dont worry that you might miss it. Its the busiest shop at the corner. Its nothing by a small room with a few tables and a very down to earth look. But the people standing in line patiently are testament to the fact that something really special is being served here. Potato empanadas with Aji de mani (peanut-chili sauce). Its out-of-the-world. We started with a small order, and then quickly got another, and another, and another. I was ready to come back again and again, but sadly we could go only once. At least go once, please! The picture does no justice to this dish. You just have to take my word for it. And the word of other Popayans! 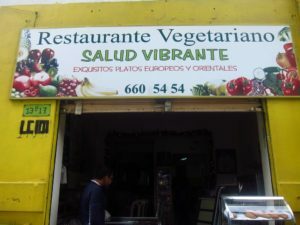 Another vegan delight that you’ll find in other places in the region. The Bocadillo! Its a great snack to carry on a hike or a day trip. 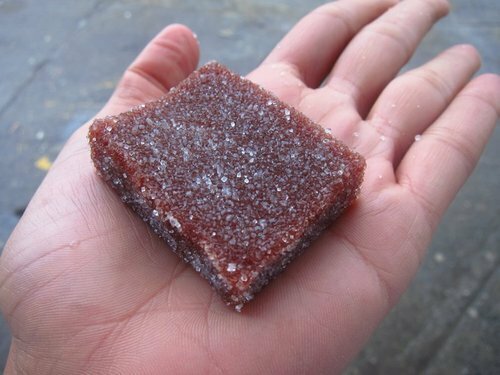 Its Guava mixed with panela or sugar. The one mixed with Panela is far superior, but the sugar version is easier to find. Get some and you’ll feel glad for the sugar rush when you’re really hungry. 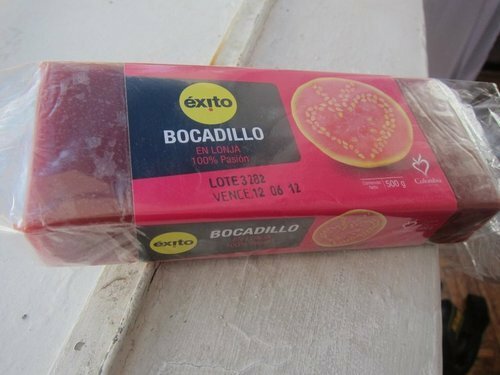 Bocadillo with panela – I found this in a tiny store in Silvia market and requested the owner to repeat the word so many times, she must have thought me weird! The owner at Park Life will tell you about this little unassuming French restaurant tucked away just a few blocks from the main plaza. Amazing vegan friendly food at very un-French prices. Great for a special meal after the rigors of backpacking. 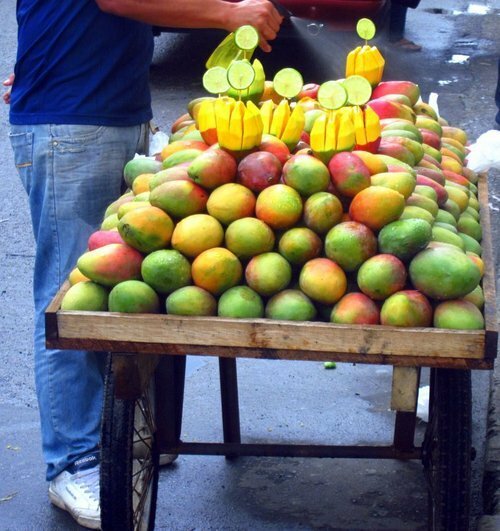 Street carts selling fruit can be found anywhere – you’ll never go hungry, my fellow vegan. 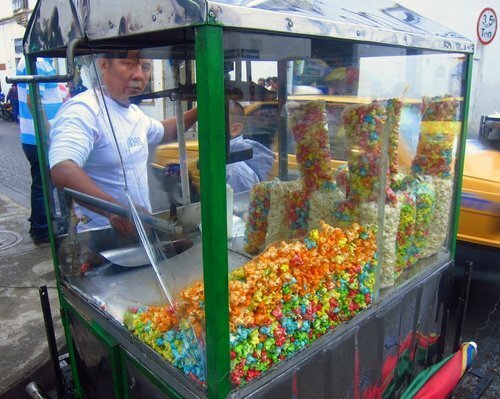 Colored popcorn! I didnt try it, but couldnt resist taking a picture. The very memory of Salento brings a fuzzy, peaceful feeling in my mind. 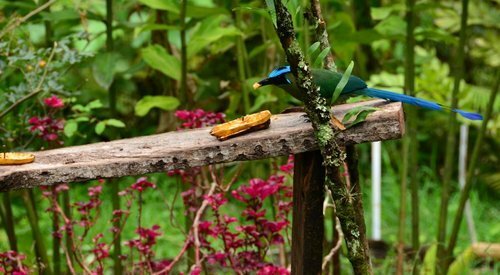 Imagine waking up in a eco farm house which is accessible to the town center of Salento by a rural mud road by a 20 minute walk, surrounded by the sounds of nature and incredibly lush greenery. Here you will hear no traffic noise, no sounds of tv, but only the occasional bark of the gentle in house dog, Pablo. One of the views you’ll find as a part of the daily grind of walking to and fro town. We spent a week at this gem of a place and it remains one of my top favorite travel experiences of my life. 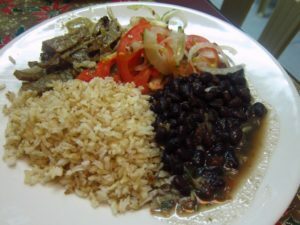 And I just mentioned to Juanita once that I only eat plants and look what she made for us for lunch! A huge bowl of scrumptiously simple salad (center) containing cabbage, carrot, tomato, onion and a dash of salt and lemon, a vegetable rich pasta with a home made tomato sauce, lemon juice. Needless to say, I took several helpings of the salad! 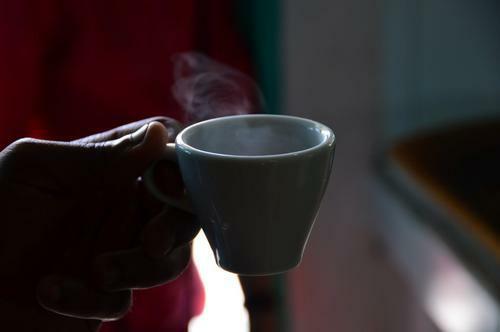 Black coffee, no sugar. Made from wild, organic, coffee beans. Pedro showed us how to roast the beans, grind them and make the coffee. Cant get fresher than this. The coffee was superb and I didnt miss the sugar at all. Back to the hostel after a trek back through the rains, a volunteer from Kenya cooked a Kenyan meal in the restaurant. For COP 15000, we got a lovely taste of Africa along with great company. We also stayed there for Christmas as did at least a dozen other travelers. Christmas special dinner was open to all and the vegetarian option was very vegan friendly! It was a candle light dinner, so the pics weren’t all that great.